Welcome to the Dungeon is a short and sweet game that can be summed up very quickly; It’s Dungeon Poker. As we delve into the mechanics of the game, you’ll understand where this bizarre comparison has come from. From the face of it though, the box is nicely presented and compact, meaning that if you carry a small bag you’ll be able to hide this game quite happily – Great for gaming on the go! 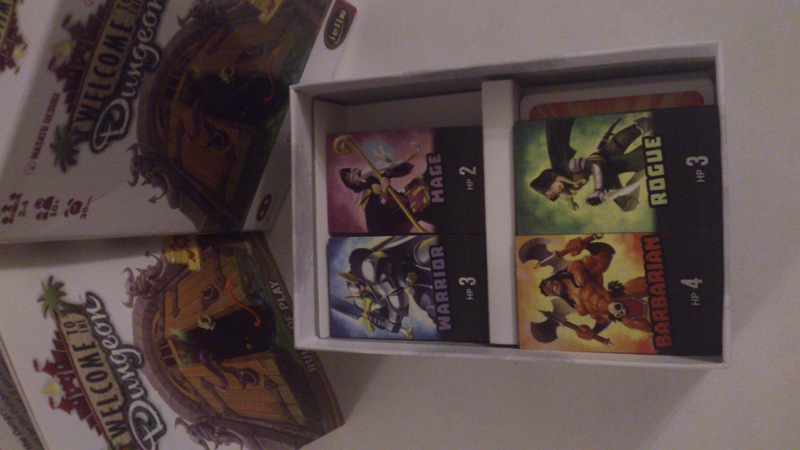 At the start of the game, all players decide which will be the first hero to enter the dungeon; ranging from the Warrior, the Barbarian, the Rogue and the Mage. Each of these heroes will have different equipment which they potentially can take into the dungeon with them, depending on the outcome of the monsters. 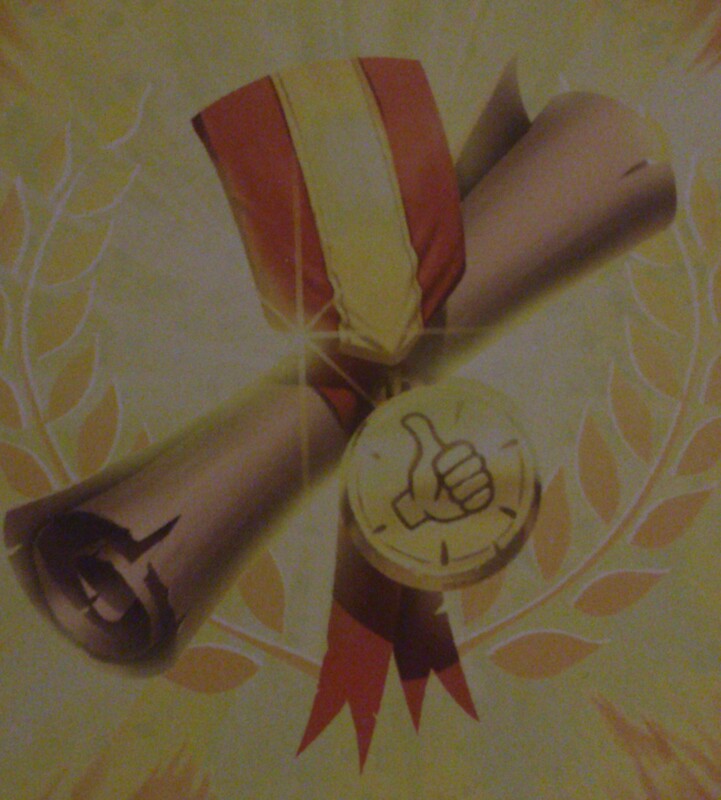 The player who enters the dungeon and successfully defeats it twice is declared the winner. 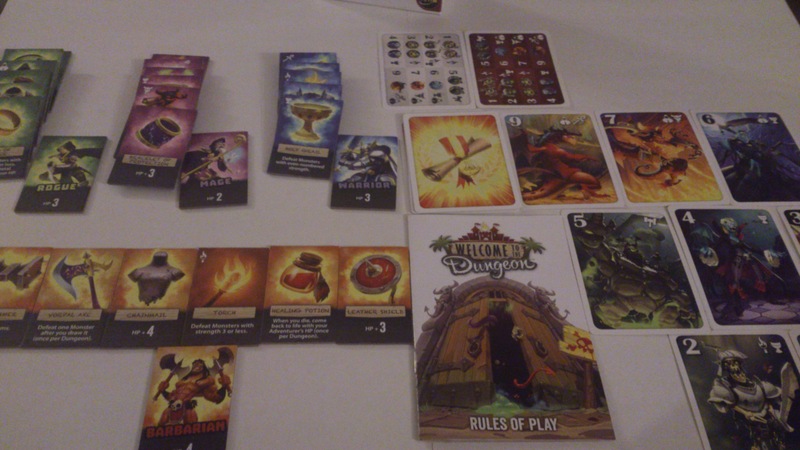 Every turn, a player gets to decide if they still want to enter the dungeon in this round (thus they draw a card which represents a monster), or they will not enter this turn. In doing so, they will not get a chance to win this round, but they will not simply lose the game. If they decide to enter the dungeon, then it’s up to the player to draw a card and if they want to see it enter the dungeon or to not. If they decide they want it to enter the dungeon, they place it in the middle of the table face down, ‘the monster pile’. If they decide not to put it in the dungeon, they do so at the cost of one of our heroes pieces of equipment. This keeps going until there is only one person left ‘in’ and they have to enter the dungeon. All monsters have a strength associated to them, so for instance a typical goblin has just 1 strength, which means they can do 1 damage to your hero. Your hero’s equipment and base health are written on their tiles, so if you have a hero with 5 health and a piece of armour that granted 3 more health, then you have a total of 8 health. Once you deduct the goblins 1 strength from your total, you’ve still got 7 health and thus you’ve beaten it. If however you’ve gone against a dragon with 9 strength with your total of 8 health, you’ve lost. Some of the other equipment pieces however, are more specialised than just boosting your health. For instance, there’s a tile for the mage called Omnipotence, which allows you to defeat the dungeon automatically if you find that every single monster entered into the dungeon are different monsters (i.e you don’t have two goblins in there). As such, some of the equipment are a bit of a gamble, but ultimately they all have a use. Some heroes have items that automatically defeat monsters, too. Let’s quickly go back to the presentation of the game; I’m really glad the product cost as much as it did! It was actually less than a tenner on Amazon, but it doesn’t feel as if the designers skimped on the production value. The monsters come in the form of standard cards, which is fine (but of a nice quality), but more importantly are the character tiles themselves. These are made of a thick stock, with a nice glossy finish. These are perfect to take to a pub, as even if a drink is spilt on them, the game isn’t ruined! Another point I’d like to make about the presentation is that it all fits so snugly in such a small box. If you have a catalogue of smaller games however, the container doesn’t stand out. Especially when we sit it next to games such as Exploding Kittens, Jungle Speed, Zombie Fluxx and more. It’s just a white box with some illustrations – However, even the container feels very nicely made. If there was anything to be said for the presentation above all else, no expense has been spared – and this makes it feel like a luxury game for a fraction of the price. Good job designers! I’d like to offer criticism for this game, but in all honesty, I don’t see there being any need to. I loved playing this and when I took it to our event a few months back, it was exactly what we needed to add to our catalogue. If there was any small thing to take away, it’s that the game when I put it down in a bunch of other games, is never striking enough alone for people want to play it, but don’t let that put you off. This is a premium product, with supremely good gameplay for people looking to play something very short and simple. A game of this can last as short as 10 minutes, or as long as an hour, depending how lucky and how well you all know the game, but there’s one thing to be said for it. If you have four people and you just want to play a simple little thing, this is your game. I’d highly recommend checking it out – So let me know what you think! Is this a good accompaniment to your selection of games, or do you think there’s nothing unique enough about it? What about the mechanic of everyone being the same hero? As always, let us know your thoughts in the comments below, or over on Facebook and Twitter. This entry was posted on March 25, 2016 by Timlah. It was filed under Gaming posts, Reviews, Reviews, Traditional Gaming and was tagged with Barbarian, Board game, Board Game Review, Co-operative, Dungeon, Dungeons, Mage, Monsters, Review, Rogue, Strategy, Tile-based, Traditional Game, Warrior, Welcome to the Dungeon.